A Giveaway with an Italian Flair! Another contest brought entirely to you by the generous donations of other myArmoury.com members! 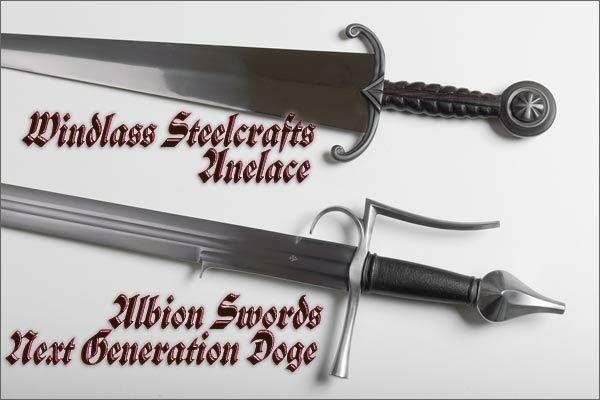 The first place prize is the Albion Next Generation Doge sword. We were able to purchase this prize with the money donated to us by you guys, the members of myArmoury.com, including a giant $500 donation provided by a very generous anonymous donor who wanted very much to help another member own an Albion sword. The Doge has become one of my absolute favorite swords and is a model that I hope one day to purchase for my own collection. It sports an Oakeshott Type XIX blade that has a flattened hexagonal cross-section and packs a punch in the cut while still having just enough nimble qualities to put the point where it needs to go. Awesome sword. Check out our hands-on review by Bill Grandy for his opinions of this piece. 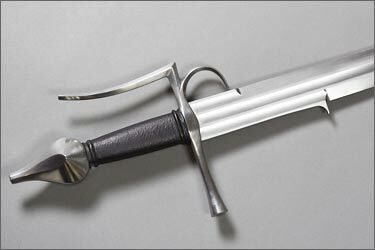 The second place prize is a Windlass Steelcrafts Anelace dagger / short sword. Another anonymous and generous member has donated this piece as a giveaway for you guys. To be honest, I was a bit surprised when I got it in hand due to how attractive it is! It's a unique piece and I'm glad to have the opportunity to give it away! For those not versed in these types of wide-bladed shorter edged weapons, I suspect you'd be surprised by it, too. 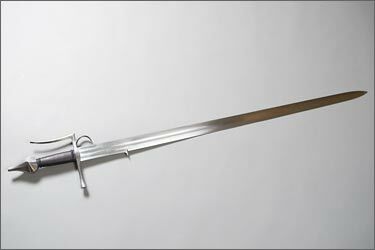 The Anelace was a weapon that filled the void between the dagger and short sword. Contemporary to the Italian Cinquedea, the Anelace was often carried at an angle at the small of the back and would be the only weapon carried in cities, at court, traveling on horseback or riding during the hunt. 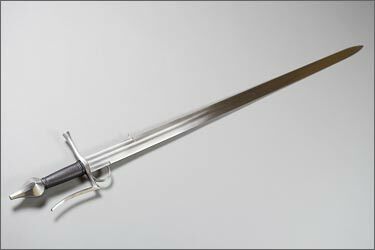 This well-balanced blade was of a size that one could use it to defend against a sword, but it could still pass as a dagger. Antiqued brass parts paired with a hand-carved hardwood grip, this attractive piece comes with a decorative scabbard. Entries must be made prior to contest close on Monday May 18, 2009 at 10:00am PST. All participants will be entered into a drawing and the winning name will be randomly selected later that same day. Very nice prizes and for once I won't participate to increase the odds of others winning one of these as I already have both. So donating is mandatory to enter, correct? The prizes for this contest were donated by members who wanted to give back to those who have helped the site financially. This contest is for those who have supported the efforts of the site. They deserve more than anyone to have contests and other special treatments for their support. That's one of the reasons this one dates back so far all the way back to July. The Dodge looks so sweet. This forum is definitely the most generous of all I'm a member of. You're so right. The Doge is an awesome sword. I want one. The blade is eerily complex with the fullers, long ricasso, "spur", and hexagonal cross-section. Very neat. I tried real hard to capture it in the various photos I've taken of it, but even those don't do it justice. I've been slowly digging through my house over the last several months finding things I can sell locally to raise "toy money". You see, I vowed to myself awhile ago not to spend any "new" money on this hobby any more and so when I want something new, I have to sell something old. It seems fair and is kind of a fun little game, I suppose. Anyway. I figure I'll place the order with Albion in a few months for the Doge. By the time it's ready, I'll have found enough money to pay for it. 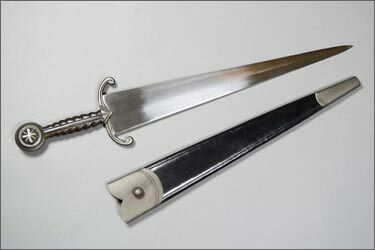 I'm toying with blackened fittings like on the antique sword shown in the hands-on review. I have plenty of time to decide. What I find surprising about the Doge is that it feels like a heavy cutter but handles like a later fencing sword: Not that one can't fence with the earlier more massive looking blades but the Doge feels close to a rapier in handling/agility but should be as good a cutter as the Gaddhjalt or not so much less so that the target would know the difference. 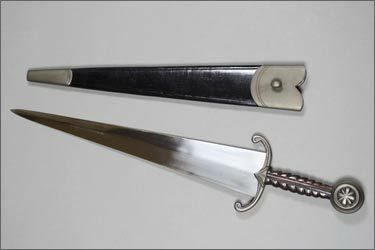 Another way of saying it might be that it looks like a sword that is much less substantial than it feels in hand without being slow or ponderous: The tool of a true swordsman ! Oh, not mentioned in the review, I think, is that the blade is not whippy at all and rigid enough that it would be a very good in the thrust. The point is sharp enough to penetrate easily an unarmoured target but rounded enough that tip cuts using the last few inches of blade would be very effective I think. I have to agree. I'm a Web developer by trade and a lot of the focus over my career has been focused on Web-based communities. I've been involved in many first-hand and have had to do a lot of research on the subject. This has lead me to study all kinds of online communities, seeing dozens of different approaches and results. With all this, I've rarely seen a group even close to the one here. You're right: these guys are generous. I feel like this site belongs to a group, as that's really what created it. Even at its core, all that has made this site is on the shoulders of the small team behind the scenes. These guys have done it as volunteers--they put the hours in and hope that it pays them back as any satisfying hobby might. But it goes beyond that and extends into the greater community: the members who every year for the last few have given their hard-earned money to pay for this place so that I no longer have to. This hasn't gone unnoticed by anyone, and especially to me. But going even further, if you really think about this community and the issue of generosity it's kind of staggering what people have given to this place. In particular, let's think about all those who come here and share their knowledge. I know that sounds cheesy, but really, think about it. The subject of arms and armour isn't a real difficult one to crack. Books are expensive and often difficult to find. Many of us, particularly those in the US, find it difficult to be exposed to a variety of antiques to see and study. Getting some of this "real stuff" in our hands is damn near impossible for many. And yet, this place has the interesting ability for just about anyone to ask even a specialized question and get a legitimately useful answer from someone out there who is generous with their obscure and hard-earned knowledge. That's all pretty unique, damn cool, and I certainly appreciate it. I just donated so I could be in this contest. Too bad I couldnt donate any more than 10 dollars. The Anelace is actually a very nice item. I snatched one up on a whim when it went on closeout on the MRL site, and it's probably ended up being my favorite out of the MRL pieces I've purchased. can the Doge be like that? The Doge might be a bit earlier period but there would be some overlap with the A & A one. The short answer is yes, and its a very good one at that. However, the design isn't necessarily the first thing that comes to mind when people use those terms. 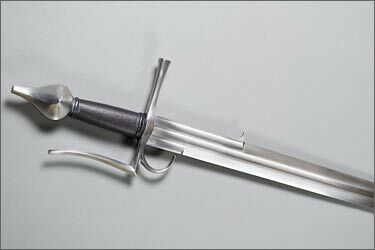 Most people think of something with a more typical "rapier" styled hilt. However I don't think your husband would complain at all if you purchased the Doge for him. Well, I have been lurking around here for a month or two now and the information that I have gathered (not to mention all the nice pictures you guys have posted ) is well worth a donation. And now I see that there are contests! How awesome is that?